News Release: Successful City-Wide Food Drive Raises More Than Ever Before! Incredible community response to Mayor Crombie’s annual food drive brings four year campaign total to over 1 million dollars and 1 million pounds of food. “This Holiday Season, Mayor Bonnie Crombie challenged the citizens of Mississauga to participate in her annual City-Wide Food Drive and feed hungry neighbours across the city. 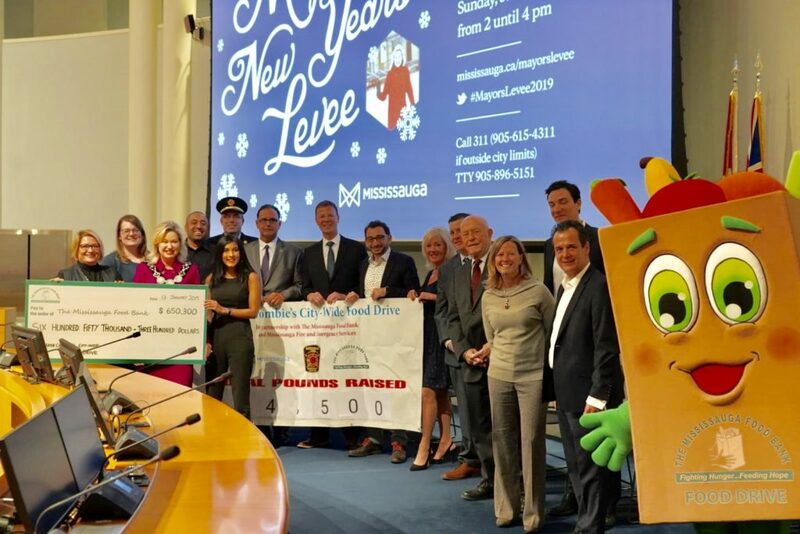 Today, at the Annual Mayor’s New Year’s Levee, Mayor Crombie announced that the campaign raised a record total of $650, 301and 404,500 pounds of food in support of The Mississauga Food Bank. This brings the total amount of food and funds raised by the campaign to over 1 million dollars and 1 million pounds since it began in 2015. This holiday campaign came at a crucial time for The Mississauga Food Bank, as the number of visits to their neighbourhood food banks increased 15% over the previous year since June. Funds raised in the campaign will ensure the food bank can purchase and distribute healthy, fresh food for over 1 million meals for neighbours who use the food bank year-round. The food raised is enough to keep up with demand through their network for the coming 7 weeks. The campaign – which ran from November 24 to January 7 – was sponsored by Tim Hortons Restaurant Owners of Mississauga, Rabba Fine Foods, and Just Energy. Mayor Crombie’s Corporate Challenge was sponsored by Wynn Fitness Clubs. The Mississauga Food Bank is the central food bank in Mississauga. Through its network of 50 member agencies – including neighbourhood food banks, hot meal programs, and breakfast clubs – they distribute food for over 2.6 million meals each year.